It’s raining right now – a steady, cool, mountain rain. I’m getting used to these afternoon storms. They take the edge off the heat and beg us to open our windows. For the most part, it’s been HOT since we moved here. And that’s not a complaint, because I much prefer sunshine to snow. Leave it to us to choose the hottest week of the year to move. We have this uncanny ability to plan our moves during the worst possible time of year. It’s either arctic or it’s sweltering. There can be no in between. This recipe was the first thing that we made in our oven. It was actually the first time we turned the damn thing on. Because when it’s 95º, you’d have to be crazy to make hot food. But when that blessed afternoon storm arrived yesterday and the mountain breeze blew in, we got started. Either way, turmeric has an impressive list of health benefits. It’s more effective than arthritis medicine and has been proven to fight depression better than anti-depressants. It can regulate blood sugar, blood pressure, and soothe digestive ailments. Need I go on? Whether or not it’s a “super” food, turmeric is definitely something we should all be eating – and it’s actually quite easy to incorporate into all kinds of food. Even potatoes.  ALSO – let’s talk potatoes for a minute. For too long now, they’ve been demonized. “They’re starchy.” “They make you fat.” Truth? They’re one of the healthiest foods you can eat. The fiber and starch in potatoes feed the good bacteria in your gut and help to regulate blood sugar. 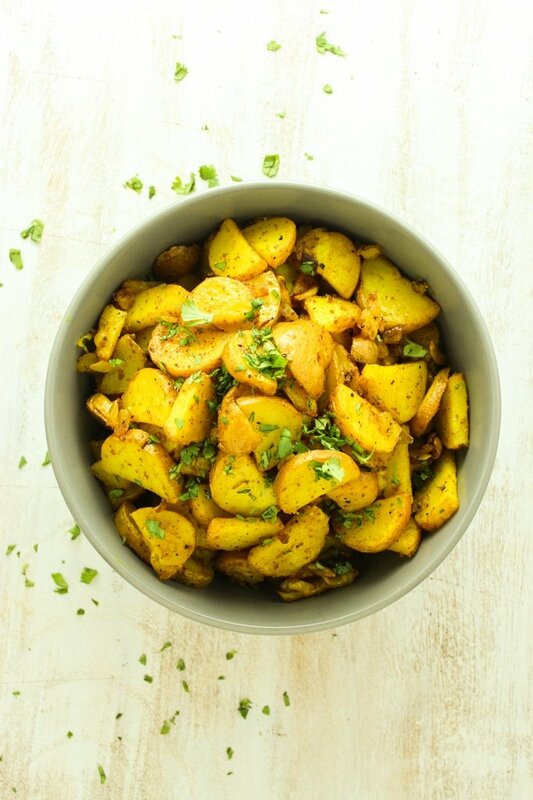 So we tossed potatoes in a savory mixture of turmeric, salt, pepper, olive oil, and curry (optional) to wrap an already healthy food in even healthier stuff. Don’t you ever feel guilty about eating potatoes again! PS – These are especially good when reheated for breakfast and topped with a yolky egg.  Just sayin’. 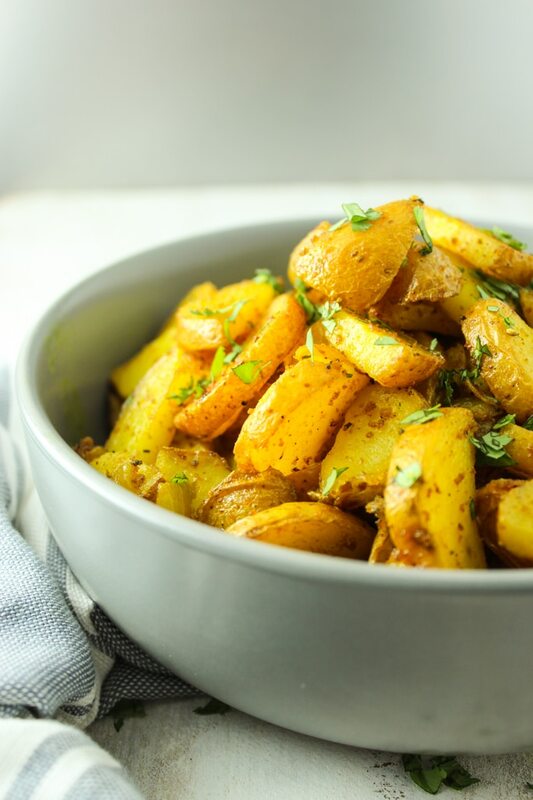 Potatoes are one of the healthiest foods on earth – these are tossed with turmeric and oven roasted to crisp perfection! In a gallon Ziplock bag or large bowl, combine onion, garlic, potatoes, seasonings, and olive oil. Mix to combine until all of the potatoes are well-coated. 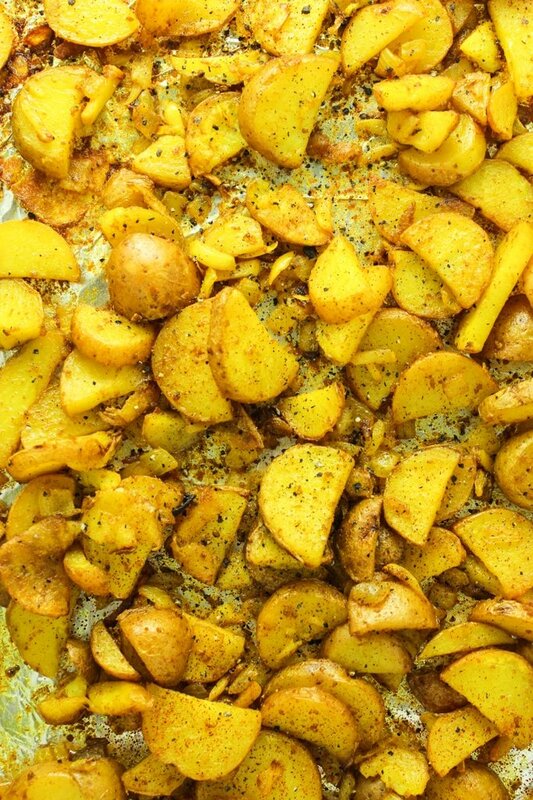 Pour the potatoes onto the baking sheet. Bake for 30-35 minutes, removing every 10 minutes to stir and toss the potatoes for even baking. 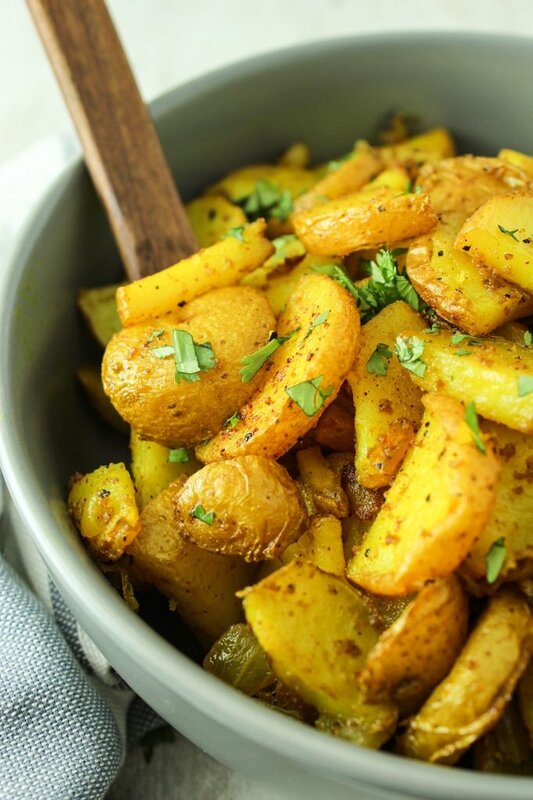 *I prefer to use yukon gold or red potatoes, but any variety would work for this recipe. Sweet potatoes would be fantastic! 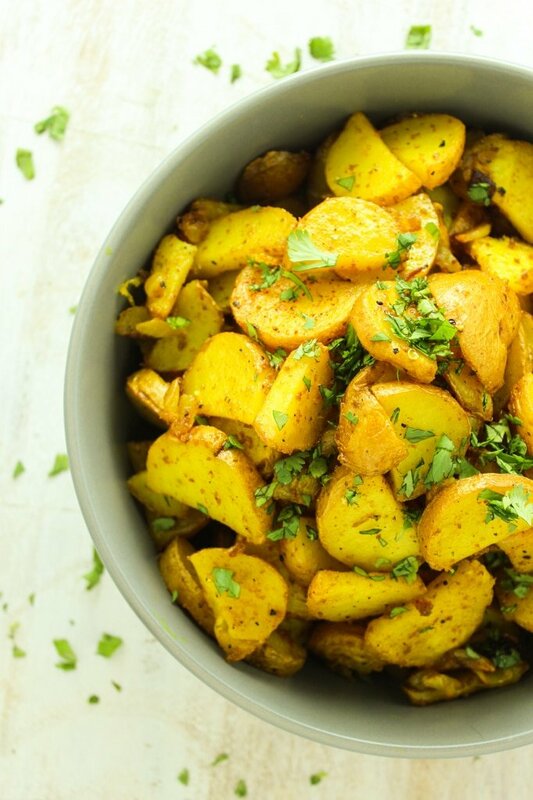 I Googled “potatoes and turmeric” because I was craving this healthy spice and I had organic potatoes to use up. I found your WONDERFUL recipe. I am so impressed. My husband and I were so happy with this dish. Thank you so much for sharing it with us! Ahhhh I’m so glad you and your husband both liked this recipe! It’s one of my go-to side dishes! Fantastic recipe. First time using turmic. Fantastic flavor. Thank you. 5 starts for this recipes! 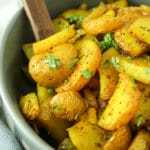 I love to cook with potatoes..therefore, Can not wait to try such recipes out. Were did you get the 1.9g of sugar from in the ‘nutrition’ section please?